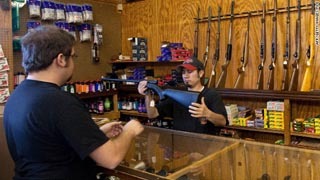 America Sets Gun Sales Record – Again | We Zombie! December was a busy month for gun purchasers, setting a record for monthy FBI background checks, topping a record just set from November sales. CNN has an article about the increase, but the reporter and the FBI seemed baffled by the increase. It’s pretty obvious to me – Americans are concerned about the coming zombie apocalypse, and want to be prepared. This is good news – our chances are a lot better when we’re prepared. The article states that “FBI officials did not offer a theory on the spike in gun sales,” but the NRA said “people feel they need guns for self defense.” OK, so maybe the FBI isn’t baffled by the increase – they’re just not offering an explanation – guess they don’t to panic the masses by mentioning the zombie apocalypse.